LMT atop Sierra Negra (4,600 m ASL) as seen from the road to reach the telescope. The Large Millimeter Telescope (LMT) is constructed on the summit of the dormant volcano Sierra Negra, at an altitude of 4,600 m (15,092 ft), and located within the National Park Pico de Orizaba in the Mexican state of Puebla. 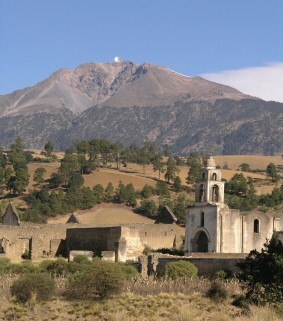 The LMT site is ~100 km east of the city of Puebla and the Instituto Nacional de Astrofísica, Óptica y Electrónica (INAOE). The proximity of Sierra Negra to the LMT observatory (LMTO) at INAOE (2 hours by road), and major cities and international airports (Puebla 85km – 2hours; Mexico City 250km – 4 hours) allows for good logistical support at the site from the LMTO staff at both INAOE and UMass. The location of the LMT site (+18º 59′ 06″ N; 97º 18′ 53″ W) provides good access to both northern and southern hemisphere astronomical sources, and the available sky coverage overlaps with that from other major observatories, in particular those in Hawaii and northern Chile.